Bacteria may grow across a wide range of temperatures, from very cold to very hot. The basic means of measuring growth requires bacterial enumeration (cell counting). Methods for bacterial cell counting include: 1. direct and individual (microscopic, flow cytometry), 2. direct and bulk (biomass), 3. indirect and individual (colony counting), or 4. indirect and bulk (most probable number, turbidity, nutrient uptake). A mesophile is an organism that grows best in moderate temperature, neither too hot nor too cold. All human pathogens are mesophiles. Cold shock proteins help the cell to survive in temperatures lower than optimum growth temperature. Heat shock proteins help the cell to survive in temperatures greater than the optimum, possibly by condensation of the chromosome and organization of the prokaryotic nucleoid. mesophile: An organism, especially a microorganism, that lives and thrives at moderate temperatures. psychrophile: An organism that can live and thrive at temperatures much lower than normal; a form of extremophile. thermophile: An organism that lives and thrives at relatively high temperatures; a form of extremophile; many are members of the Archaea. 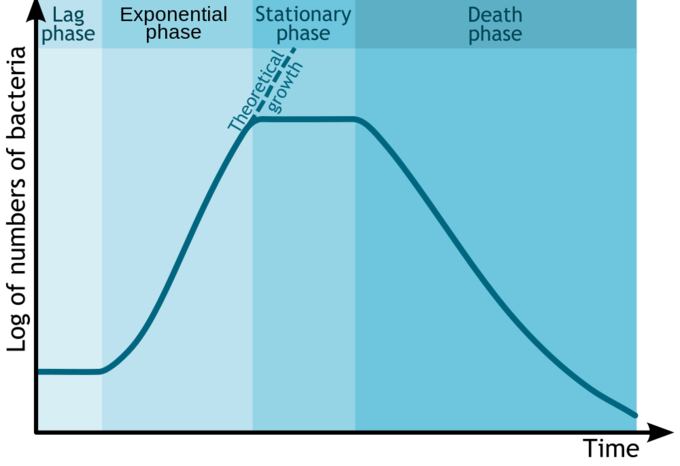 Bacterial growth curve: Bacterial growth in batch culture can be modeled with four different phases: (A) the lag phase, when the population stays roughly the same; (B) the exponential, or log, phase, when the population grows at an increasing rate; (C) the stationary phase, when population growth stagnates; and (D) the death phase, when bacteria begin to die off and the population decreases in size. Bacterial growth is the division of one bacterium into two daughter cells in a process called binary fission. Providing no mutational event occurs the resulting daughter cells are genetically identical to the original cell. Hence, local doubling of the bacterial population occurs. Both daughter cells from the division do not necessarily survive. However, if the number surviving exceeds unity on average, the bacterial population undergoes exponential growth. The measurement of an exponential bacterial growth curve in batch culture was traditionally a part of the training of all microbiologists. The basic means requires bacterial enumeration (cell counting) by direct and individual (microscopic, flow cytometry), direct and bulk (biomass), indirect and individual (colony counting), or indirect and bulk (most probable number, turbidity, nutrient uptake) methods. Models reconcile theory with the measurements. 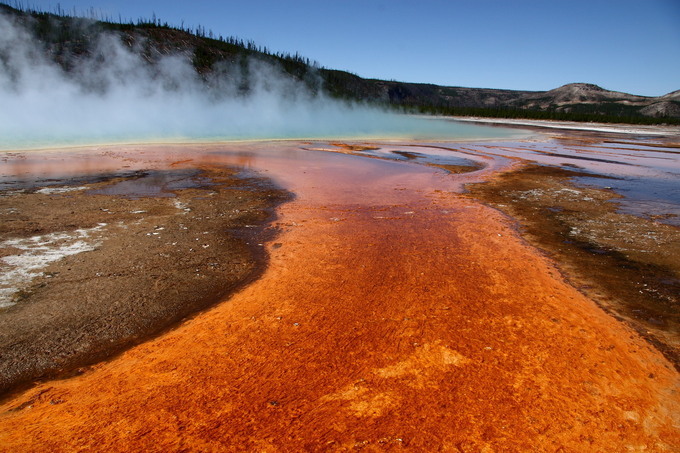 Grand Prismatic Spring, Midway & Lower Geyser Basin, Yellowstone National Park: This photo shows steam rising from hot and sterile deep azure blue water in the center, surrounded by huge mats of brilliant orange algae, bacteria and archaea. These colorful microorganisms are called extremophiles—these in particular are thermophiles. Bacteria may grow across a wide range of temperatures, from very cold to very hot. A mesophile is an organism that grows best in moderate temperature, neither too hot nor too cold. All human pathogens are mesophiles. Organisms that prefer extreme environments are known as extremophiles: those that prefer cold environments are termed psychrophilic, those preferring warmer temperatures are termed thermophilic or thermotrophs and those thriving in extremely hot environments are hyperthermophilic. For example, in molecular biology, the cold-shock domain (CSD) is a protein domain of about 70 amino acids which has been found in prokaryotic and eukaryotic DNA-binding proteins. Part of this domain is highly similar to the RNP-1 RNA-binding motif. When Escherichia coli is exposed to a temperature drop from 37 to 10 degrees Celsius, a four to five hour lag phase occurs and then growth is resumed at a reduced rate. During the lag phase, the expression of around 13 proteins, which contain cold shock domains is increased two- to ten-fold. These so-called cold shock proteins are thought to help the cell survive in temperatures lower than optimum growth temperature, by contrast with heat shock proteins, which help the cell survive in temperatures greater than the optimum, possibly by condensation of the chromosome and organization of the prokaryotic nucleoid.